Giants fans need to realize something. The Giants believe in themselves a lot more than most of their fans do right now. Although chances are still slim, the Giants are still in this playoff race. With 8 games remaining, the Giants are 3.5 games back of the Braves and 2.5 games back of the Cardinals (based on results before the game on September 20th). There is not much point looking at how the Diamondbacks are doing, because the Giants have pretty close to no chance of winning the NL West. So what does this mean for the Giants’ chances? Should Giants fans still believe in their team or just prepare themselves for next season? Well, it’s quite simple. Giants fans need to approach this last stretch of the season with this mindset: do not get overly pessimistic or overly optimistic. This might sound very contradictory and sound almost like a cop-out answer, however, I have my reasons. Giants fans cannot be too pessimistic simply because this is September baseball. Baseball can change in an instant and nothing, I mean nothing, is certain in baseball, especially during September. Crazy things can happen when teams get on a roll, and you never know what teams will being to falter under the pressure. With this in mind, Giants fans cannot become too optimistic either. Optimism can result in false hope and excessive, unnecessary stress. I don’t mean to be a Debbie Downer, but it will literally drive a fan crazy by constantly watching the scoreboard and thinking of game-by-game situations on how the Giants can make the playoffs. It’s a waste of time, since baseball is so unpredictable. Giants fans should just sit back, relax, and enjoy the ride, aka Giants Torture. Even though Giants Torture began last year, it is very much alive this year, so expect to see much more drama these remaining 8 games. The Giants thrive on drama, whether it be a come-from-behind win, a 4-home run inning, or a Brian Wilson save. 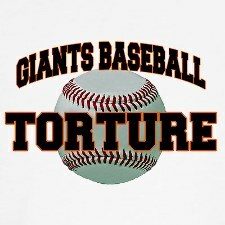 Giants baseball is dramatic and torturous, and we love it. So why not just enjoy the rest of the season, stress-free? The Giants are only going to be reigning World Series Champions for so long, so enjoy it while you can. Keep bragging about it and keep supporting the champs. Just don’t get to pessimistic or optimistic.